In her inspirational new memoir DARING TO HOPE , published by Multnomah on Tuesday, October 3, Katie Davis Majors faces such questions as, “How do you hold on to hope when you don’t get the ending you asked for?” When Katie moved to Uganda more than a decade ago, accidentally founded a booming organization, and later became the mother of thirteen girls through the miracle of adoption, she determined to weave her life together with the people she desired to serve. But joy often gave way to sorrow as she invested her heart fully in walking alongside people in the grip of poverty, addiction, desperation, and disease. DARING TO HOPE is an invitation to cling to the God of the impossible. Though readers’ heartaches and dreams may take a different shape, they may find their own questions echoed in the book’s pages. In this “Meet Our Author” interview, Katie delves inside the creation of her book, her writing regimen, working with Multnomah, and what parts of the book she thinks will connect directly with readers. 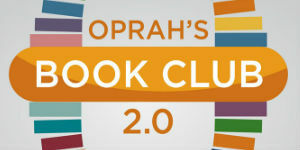 How and when did you know that the experiences, events and emotions you chronicle in DARING TO HOPE would evolve into a book? Honestly, the first draft of this book was mostly written on post it notes and little scraps of paper lying around my house. I had no idea a book was forming. I was going through a season of grief and hurt. I had a lot of questions, and I was trying to reconcile my heart and my head, what I knew to be true about people and about God, and what I doubted. When I compiled them together and saw some of the themes, that’s when it occurred to me, maybe I’ve written another book. Still it took several months before I shared it with my agent. It had been six years since my first book, Kisses from Katie, and I was nervous to re-engage public life. 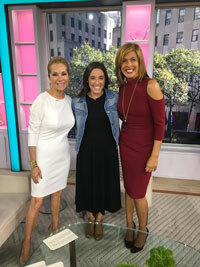 [caption id="attachment_8010" align="alignleft" width="200"] Katie Davis Majors (middle) on the Today Show with Kathie Lee Gifford (left) and Hoda Kotb (right)[/caption] How would you describe your writing regimen and the process of creating your narrative voice? Well, I have fourteen children, one of whom is a baby. And I homeschool. I have an organization I help run that serves people here in Uganda. My writing regimen is like the rest of my life – squeezed in between family and work and everyday living. Unlike Kisses from Katie, I’m married now, so I relied a lot on help from Benji. He would watch the children while I would work. I had writing days, where I would carve out huge chunks of consecutive days to crank out the manuscript. My editor was an amazing support. What has it been like having Multnomah as your publisher? I have loved working with Multnomah. They have been supportive, encouraging, and champions for DARING TO HOPE since the very beginning. I feel like they understand this message, understand my heart, and want others to hear it. Some of the people on the team have supported our non-profit organization, and another is an adoptive mother. It’s been extremely collaborative. 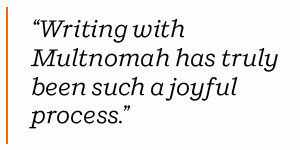 Writing with Multnomah has truly been such a joyful process. I am grateful. 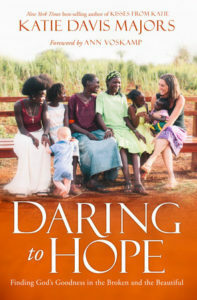 What elements of DARING TO HOPE do you think will resonate most strongly with readers? 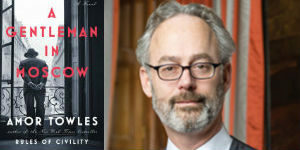 Although some of my specific experiences might be unique, many of the themes of DARING TO HOPE are not. We all have our struggles and our sorrows. I lost a child to an unfair system, but everyone can relate with what it feels like when unfair things happen to them. I prayed and nursed my friend Katherine back to health for months, and I sincerely thought she was getting better, and then she tragically died. I am not the only person out there who has experienced the tragedy of death or loss. I was a single mother of 13 children and I doubted whether I would ever find a man who would be able to join me in my life’s work, as a father to my daughters. Many singles understand this and wonder how their calling is going to fit with a family. I saw that sometimes things work out as you hope and sometimes they do not. 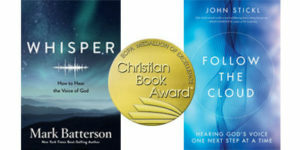 I had come to the edge of DARING TO HOPE: Do I really believe in God’s goodness even if the ending turns out differently than I hoped? So many of us know that feeling, of being on the edge, that line between hoping for miracles and fearing disappointments. I hope these words help people feel less alone.